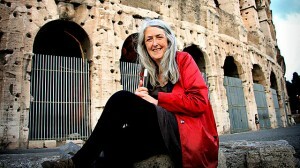 Mary Beard is 57, intelligent, and on our TV screens presenting and sharing her passion for all things Roman. But it seems that not everyone is happy. Why? Because Mary does not conform to the stereotypical image of the presenters we are used to seeing on screen. It seems that while some appreciate her in depth knowledge of Roman history and culture which Mary so happily shares, others, such as critic AA Gill are keener to criticise Mary’s lack of make-up and use of a personal stylist. Mary is happy to be appear on screen without artifice, being comfortable in her own skin, and according to an interview given by Mary for the Daily Mail, she is hoping more women like herself will appear alongside her on our screens. Mary makes the point that she hopes that people appreciate her not for what she looks like, but for what she does. Besides, “Who defines beauty?” Mary asks. I , for one, think it’s great to have Mary Beard on our screens, but then I love certain periods in history, and cannot miss David Starkey on TV whenever he offers insights into the Tudors. For me it’s all about the subject matter, and is seems more real when brought to life by people who have both the knowledge and passion for the subject. So is Mary right to ignore her critics and face the nation without make-up or hair dye showing us all that she is more than comfortable in her own skin? Or as AA Gill suggests, should she be making more of an effort? Would love your thoughts on this….. Personally, I believe we should have the confidence to go out however we want. AA Gill epitomises just how shallow people can be – what gives him the right to judge anyone else? He has already criticised the wonderful Clare Balding, and now, Mary Beard. Both are women with fabulous personalities, intelligence and humour, attributes that AA Gill seems to have been at the back of the queue for. is this really how we’ve come to define people? How can it be that we judge a person by their looks alone, and not by what they have to say? Aren’t we postulating, by paying more attention to appearance than to content, that only someone who looks like a Vogue cover has something important to say? And why, please, does this only apply to women? Pots and kettles come to mind – AA Gill is no oil painting. Mary Beard, on the other hand, looks pretty amazing. I haven’t seen the programme, but judging from the photograph accompanying your article, I can’t see what he’s talking about. I do hope that Mary Beard’s sense of herself allows her to shrug off Gill’s nasty remarks and that she doesn’t give in to pressure to conform. We need more female role models like her on the TV. How we present ourselves to the world is a purely personal choice. Mary Beard is a highly intelligent, accomplished, energetic and delightful human being. She obviously feels no need to ‘enhance’ the persona she presents to the world, and why should she? Her beauty as a person shines through and needs no enhancement! I really like her look…so what is the problem? Yes – the problem lies with AA Gill et al, not with Mary. She looks great! Good lord – have you seen A A Gill – not exactly Brad Pitt – however he would not be criticised because he is not a Moie star or model – he is a Food Critic and frankly quite full of himself. Mary Beard s an intelligent woman, with personality,wit, individual style, humour AND IS INTERESTING! Enough said. This says so much more about AA Gill than it does about Mary Beard. I love Mary Beard! She is a brilliant role model, very funny and brings to life the Romans in her own inimitable style. But what about the way she looks? To me she looks really comfortable in her own skin and with her own style – loving the red coat by the way! So many women struggle with how they look that it is refreshing to see someone who doesn’t seem to. Put simply…. Mary Beard rocks! Who would I like to have dinner with? Not A A Gill, as I can’t stand pathetic male chauvinists. Certainly Mary Beard: fun, funny, interesting, knowledgeable. Appearance is irrelevant, although as it happens, I think she looks good. Does Grey Hair equal Invisibility as Mary Beard suggests?